All VC mission partners engage in Due Diligence processes before a formal partnership is formed. 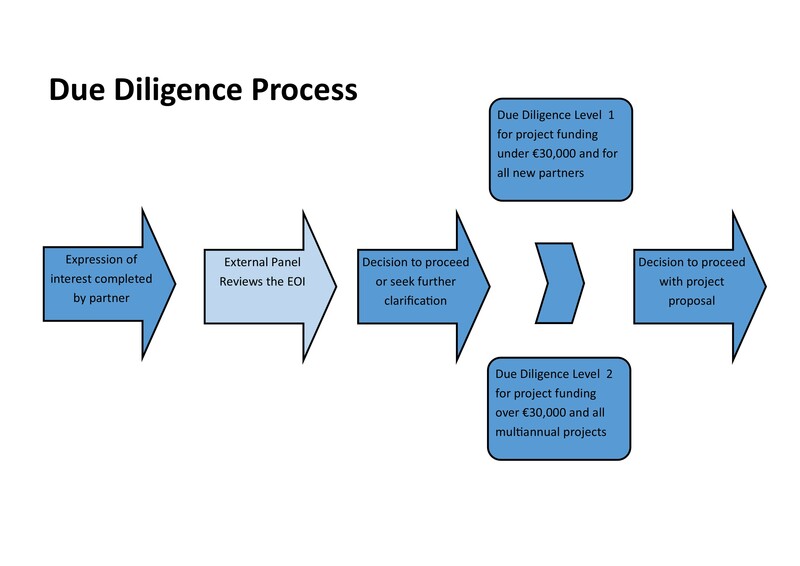 The pre-due diligence involves the preliminary screening of potential partners, in which partners are requested to complete a Self-Assessment Pre-Due Diligence Questionnaire. This questionnaire, alongside VC extended research, is then presented to VC’s external Partner Assessment Panel, where a decision regarding the new partnership is formed. The external panel is made up of independent experts with extensive experience in international development, project management and business skills. Potential partners, at this stage, are either approved to the next level of due-diligence (level 1 is for projects requesting funding for under €30,000 and level 2 is for projects requesting funding over €30,000), rejected or requested to provide further information. These additional stages explore the partner organisation in more depth, including a field-visit where appropriate, and further assess if the organisation is adequately structured, has reasonable levels of financial accounting and control, experience of delivering development programmes and good governance. After both stages of Due Diligence and external review, a new partnership has the opportunity to be forged.